When Hank Marvin of The Shadows asked Burns to make him a signature guitar a matching bass was also required to keep the uniformed look associated with the band. The Shadows Bass was duly designed and built for John Rostill and such was the interest it created a small production run was begun. Rostill's bass was actually slightly different to the production models with 'Marvin' on the headstock and both the pickups and the toast rack palm rest were not set at an angle. 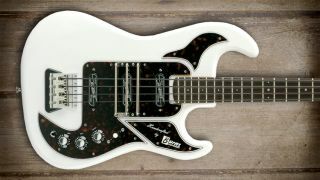 With the relaunch of the Burns name it reappeared during the nineties as a very favourable edition with Rez-o-Matic pickups and even a fretless version then in 2005 Burns of London acquired Rostill's original bass and produced a limited run of The Shadows Bass 1964 which was modelled as close as possible to this lovely instrument. However it also benefited from an improved bridge and enhanced electronics with push/pull tone pot for two extra pickup combinations plus a 5-way selector switch.